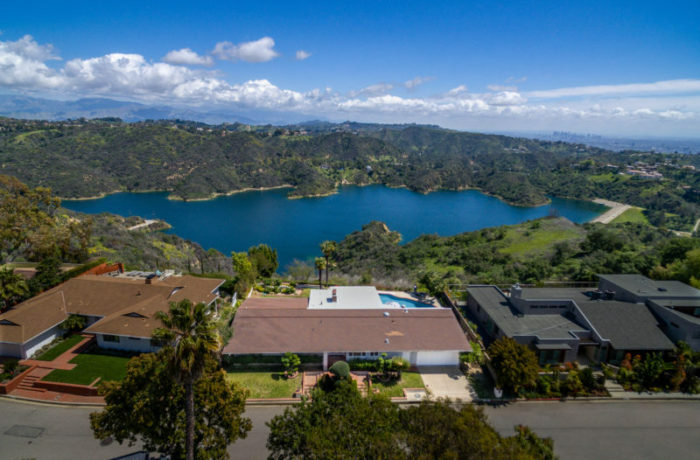 Offered for Lease for $10,000 per month | Upscale remodeled single story 3 bed, 4 1/2 bath home tucked away in the hills of Bel Air. The indoor/outdoor entertainer’s home has recessed lighting, light wood floors and large windows throughout drawing in the breathtaking Stone Canyon Reservoir view ushering in tons of natural light. Oversize kitchen with beautiful countertops, gas stovetop, large center island with steel gray cabinets, stainless steel appliances and walk in pantry. The open floorpan has living room with high ceilings, gas fireplace and a den with bathroom overlooking the backyard. A striking master suite features an office area with fireplace, en suite with dual vanities, jacuzzi tub overlooking reservoir, oversize shower and walk in closet. Additionally there are two generous sized bedrooms with their own en suite. Other amenities include heated pool, Central AC/Heat, gas fireplace, laundry room with hook-ups and attached 2 car garage. Located in the prestigious Roscomare Road school district.